Following the last instalment of the CB1 interview series, we spoke with Tony who owns the Bike Station on Mill Park. 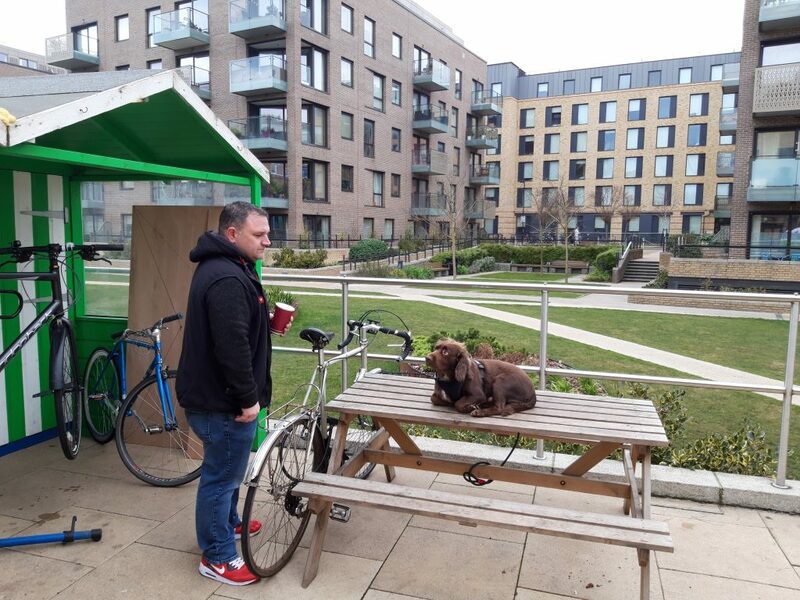 Previously located at the junction between Station Road and Mill Park, Tony and Pedler the dog have been based outside Aston House at Mill Park since October. In this interview, we chat to Tony about his business and about CB1. What are your most popular services you do? We do lots of different things including servicing, refurbishment of old bikes and the supplying of parts for bikes. It’s generally quite popular for people wanting to get minor repairs to their bikes. Refurbished old bikes which we sell on are also quite popular particularly in September/October time when new students move to the area. Shortly, we will have an offer going on which is 20% off when you present the Spring edition of the See, Be newsletter which will be coming out in late February/early March. This offer will last until 31st March 2019. How are you finding your new location at Mill Park? Love it. It is nice to be away from the building site and not have cars and buses going past all the time. It is nice to be in quite a quiet area with residents and students around and it is clean and tidy which is great. At first, some of our customers weren’t sure where we had relocated to, but the word has been getting around which is good and we have picked up some new trade from the Hills Road area. What changes have you seen taking place since you first started trading here in CB1? I am Cambridge born and bred and we’ve been here for three and a half years and have got to know a lot of people and businesses round here. From our previous location, I saw the hotel and One The Square go up and so there has been a lot of change in the area. What do you most like about CB1? The local people here. There are always people about and with the green now reopen, it is nice to see people using the space. Particularly with regard to dog walkers, there are more dog walkers around now and it is good to see them coming into the area. That’s great for Pedler too! Does your business feel part of the community? Definitely. Local families like seeing Pedler and local residents pop in for bike repairs and kindly give Pedler some dog treats that he really enjoys! What do you hope for the future of your business and the CB1 Estate? My hope for the future of CB1 is that when everything is finished, it will be a nice, thriving place. As for the business, it will be good to continue enjoying our new location here at Mill Park. It will certainly be a nice spot in the summer! Many thanks to Tony for giving up some time to speak to us.